Information revised March 6, 2013. IT specialists looking for employment might want to consider the General Motors Company. The Detroit-based car manufacturer is hiring, but it wont be looking for workers to fill suites at its Michigan corporate headquarters. Instead, the company announced that is has chosen a location in Roswell, Ga., near Atlanta for its newest IT innovation center. The new facility joins similar facilities located in Austin, Texas, and Warren, Mich. The Atlanta area gives GM a deep pool of skilled IT workers. The city is home to a number of prominent colleges and universities including Georgia Tech, and is also home to multiple Fortune 500 companies including the Coca-Cola Company, Southern Company, SunTrust Banks and Genuine Parts, the latter owner of the NAPA auto parts stores. GM is hiring software developers, project managers, database experts, business analysts and other IT professionals and reports that three out of every four candidates that have been offered jobs so far have accepted them. GMs innovation centers were developed to bring previously outsourced work back under the company’s direct control. This Innovation Center is exactly the kind of employer we want in the state, said Georgia Gov. Nathan Deal. The information age will be with us for a long time, and attracting companies such as GM that are on the cutting edge of manufacturing and technology is a huge win for Georgia. GM Chief Information Officer Randy Mott noted that the innovation centers should help GM reduce its operating costs while providing innovative products and services for its customers. Said Mott, The IT Innovation Centers are critical to our overall GM business strategy and IT transformation. A fourth innovation center was announced in March 2013, this one planned for Phoenix. All told, GM plans to hire as many as 4,000 people to staff its four centers over the next three to five years. GM’s staffing needs have changed dramatically in recent years as it has laid off tens of thousands of factory and office workers in a bid to realign its business. However, the company has continued to seek highly skilled workers to handle a number of tasks including software development, electrical design and engineering. Those opportunities include an electrical engineer opening in Rochester, N.Y.; a fuel cell system design engineer opportunity in Pontiac, Mich.; and an advanced interior designer position in Los Angeles. GMs Atlanta opportunities are already posted online under its information technology job section. The 2013 Toyota Corolla S (Photo: Toyota Motor Sales USA). The compact car segment has strengthened in recent years as new models enter the fray, contending with established leaders including the Honda Civic and Toyota Corolla. These days, every major manufacturer has a stake in the segment with the Dodge Dart the most recent entry to hit the market. For 2012, the auto trends we have been observing continue to point to increased sales for compact cars that are usually sold in sedan and hatchback body styles. These vehicles usually are priced from about $16,000 and are powered by small, efficient in-line four cylinder engines. Manual and automatic five- or six-speed transmissions are typically used; each model is front-wheel-drive and offers seating for up to five occupants. Beyond the top sellers, we will take a look at a number of also rans for the calendar year. 1. Honda Civic. For 2012, the Honda Civic pushed past the Toyota Corolla to achieve the best selling compact car in America title. Introduced in 1973, the Civic has been updated, enlarged and redesigned numerous times. Its most recent design update was panned by critics, but that hasnt stopped shoppers from flocking to a car prized for its reliability and value. Sales rose by 43.7 percent in 2012 to 317,909 units, demonstrating that Honda has put the horrors of a March 2011 earthquake and tsunami in its rear view mirror. 2. Toyota Corolla. Corolla not only loses its leadership in the US market, it apparently has seen its global edge erode too. While the Honda Civic is on top of the heap stateside, the Ford Focus is now the best selling car in the world, supplanting the Corolla. 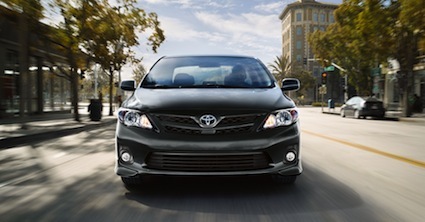 Corolla and Toyota Matrix sales are combined for reporting purposes with those sales up by 21.1 percent over 2011. Toyota sold 290,947 of its compact models in 2012. 3. Ford Focus. Unlike Honda and Toyota whose 2011 sales were suppressed by a natural disaster, sales of the Ford Focus rose naturally in 2012. Ford claimed a 40 percent increase in sales for its compact sedan and hatchback, selling 245,922 Ford Focus models in 2012. The Ford Focus is also now the best selling model in the world, with about 1 million units sold in 2012. 4. Chevrolet Cruze. Sales of the Chevrolet Cruze rose by 2.1 percent to 237,758 units, but that wasnt enough to keep this vehicle from being surpassed by the Ford Focus. The fifth place leader, the Hyundai Elantra is closing in, but with a diesel model in the offing this year, the Chevrolet Cruze should continue to enjoy strong sales again in 2013. 5. Hyundai Elantra. Much credit must be given to Hyundai for bringing multiple winning models to the market in recent years. Despite its fuel economy dust up, sales of the Hyundai Elantra rose by 8.4 percent in 2012, topping 200K units for the first time. Some 202,034 sales were registered in 2012, helping Hyundai beat out larger competition including Nissan, Volkswagen and Dodge. The Volkswagen Jetta is a trusted vehicle and again nearly 150,000 units were sold in 2012, representing this German manufacturers top model by far. Other players worth a look include the Dodge Dart, Nissan Sentra, Kia Forte and the Mazda Mazda3, compact hatchbacks and/or sedans offering great value, reliability and varying trim levels to suit most drivers tastes.